Is Wal-Mart Rolling Back Organic? Last spring, Wal-Mart made a huge public relations bonanza out of its plan to sell organic produce and dairy products. Now, admittedly, it’s easy to nitpick at the retail giant. But is it nitpicking to object to their systematic mislabeling of conventional products as organic? 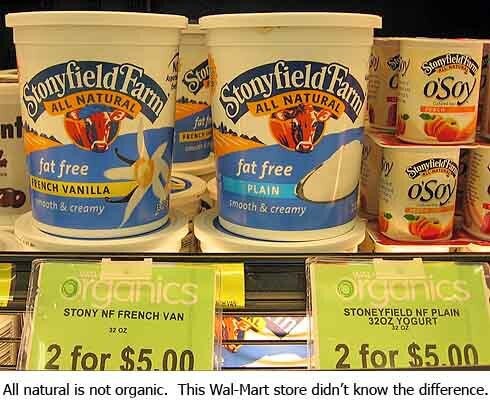 The Cornucopia Institute, a watchdog group of the organic industry, has accused Wal-Mart of labeling—and pricing—conventional produce and “all natural” dairy products, such as Stonyfield Farm yogurt, as organic in its stores in several states. The Institute says the violations continued even after it wrote a letter to Wal-Mart CEO Lee Scott alerting him to the problem. Organic producers can’t just hang up a sign, as the mega-retailer has done, calling their produce organic. They must adhere to strict production standards for three years before they earn the right to call themselves organic—and to demand the correspondingly higher price.